He is an old wheezy guy with a gimpy leg and stinky halitosis, but he is unstoppable when it comes to terrorizing and killing athletic yuppies a fraction of his age. There is the horror movie mentality: fear gross old people. “Gerald,” as he is identified in the credits, is quite the creep. His hobbies are spying on his tenants and keeping women locked up in a remote cellar. The stakes will rise when he starts a dark web live-cast in Seth Fuller & Scott Hussion’s 14 Cameras (trailer here), which opens today in New York. Yes, this is the sequel to 13 Cameras, so that probably tells you all you need to know. However, screenwriter Victor Zarcoff (who also wrote and directed the first film, originally titled Slumlord) deserves credit for mixing things up here. The latest family that has rented one of Gerald’s vacation condos are still completely unaware of his invasion of their privacy. Yet, things take an even darker but quite interesting turn during the third act. Gerald’s latest abduction victim is also quite a fighter. Frankly, the psycho-sicko might be spreading himself too thin. In fact, his strange hours and constant shipments of weird video gear finally arouses the suspicion of someone close to him (at least in terms of proximity, but not necessarily emotional attachment). For what its worth, 14 Cameras is superior to 13 Cameras, by a factor of five or six. Apparently, that extra camera makes a world of difference. Keep in mind the new film still suffers from many of its predecessor’s flaws and excesses, but at least there is some suspense this time around, because the ending is not an obvious downer of a foregone inevitability. As Gerald (screen name “Slumlord”), Neville Archambault is undeniably creepy, but it is even harder to buy into him as a slasher superman three years later. Seriously, it gets downright painful watching him puffing and panting through his kill scenes, sort of like the spectacle of Gerard Depardieu playing action heroes in movies like Viktor. Sure, we’ve seen worse. Heck, 14 Cameras is better than the thematically similar Unfriended: Dark Web. Of course, Airbnb and various internet share swap sites will not be too crazy about it, but its cautionary privacy warnings are not uncalled for. 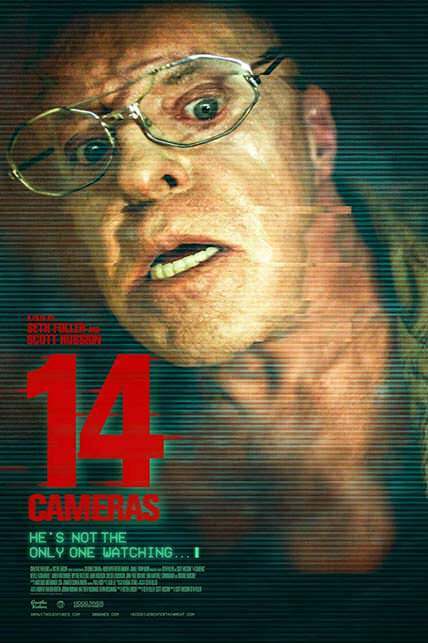 Nevertheless, 14 Cameras is not exactly great cinema or required viewing. We still can’t recommend it, but we do not resent spending time to review it. For fans of the franchise, 14 Cameras opens today (7/27) in New York, at the Cinema Village.